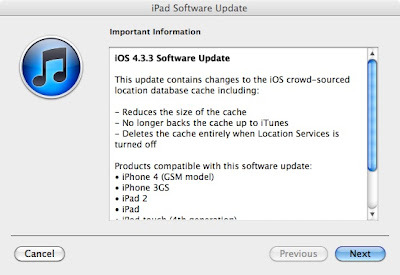 Today, Apple released the iOS 4.3.3 update for iPhone 4 (GSM), iPad, and iPod touch alongside of iOS 4.2.8 for the iPhone 4 (CDMA). Today's updates are intended to address the location tracking issues around the consolidated.db file that contacts a large amount of cellular and Wi-Fi hot spot location tracking data that is used by an iPhone, iPad, or iPod touch to help the device locate itself. Today's updates can be applied to the iPhone 4 (GSM model), iPad and iPad 2, iPhone 3GS, iPod touch (4th and 3rd edition), and iPhone 4 (CDMA model). Use iTunes 10 on your Mac or Windows PC to download the software and update your device.